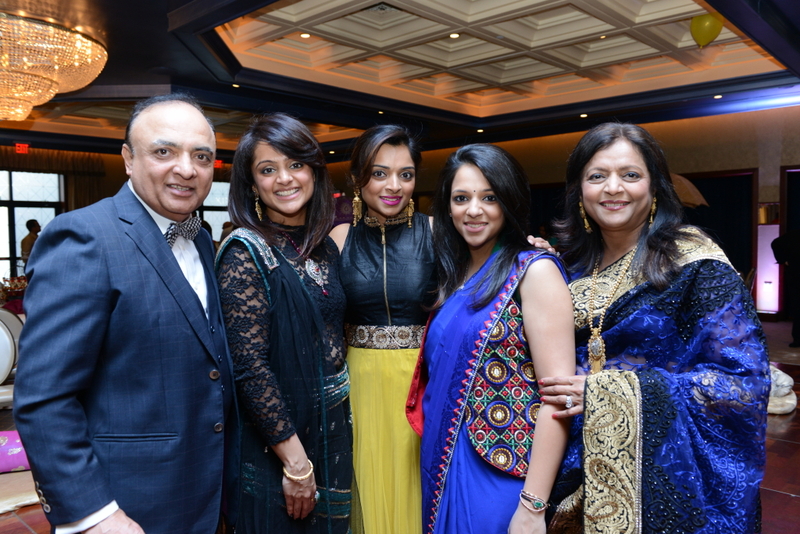 As you all know, we recently celebrated Mommy Vaid’s 60th birthday in true Bollywood style – an Antakshri themed party! 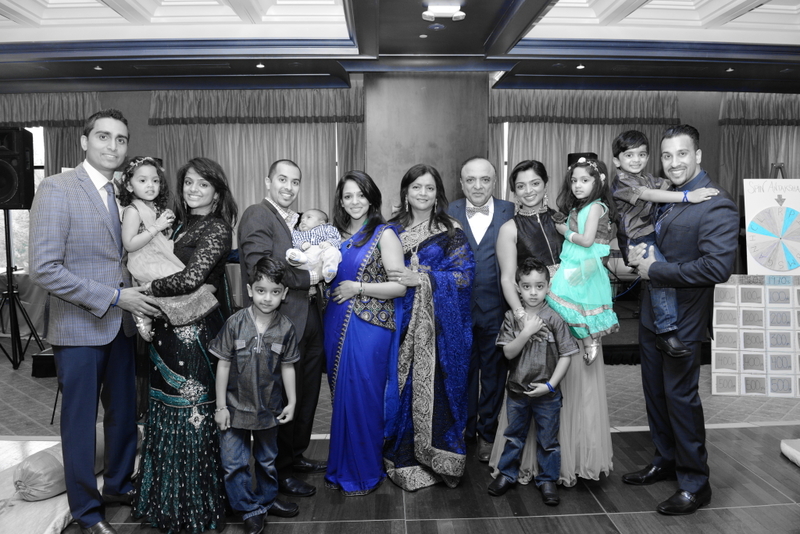 Mommy Vaid isn’t the party type and really just wanted to do dinner with her family and closest friends group. However, us girls wanted to do something special for her since we rarely get to celebrate the most amazing woman we call mom. We came up with throwing a music themed party since from the beginning of time Mom has been a huge fan of Indian music. We remember when we were younger, every year during Navratri our parents used to host parties at our house with their friends and a professional singing group and Mom would always get on the mic and shock everyone with her amazing voice and grace. For decorations we kept it pretty simple and naturally did a lot of DIYs. 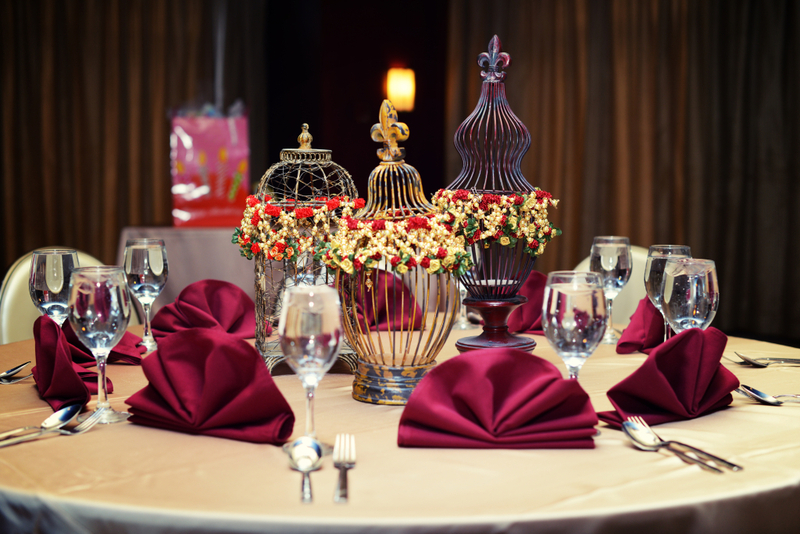 We took old birdcages that we had and wrapped them in Indian “toran” and placed 3 on each table. 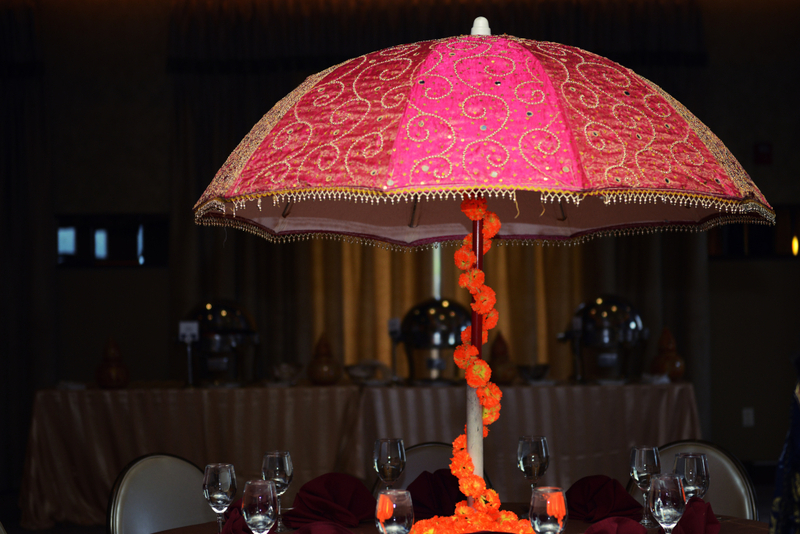 We also ordered some tall umbrellas for a few tables to give some dimension to the ballroom. We added “gadlas” and “takiya” on the floor to add to the antakshri theme as well! We wanted to do a special cake for mom since she really appreciates sweets and to appeal to her sweet tooth! We had The Cake Box by Neelma make a very special cake for her which came out perfectly in light of our last minute order! 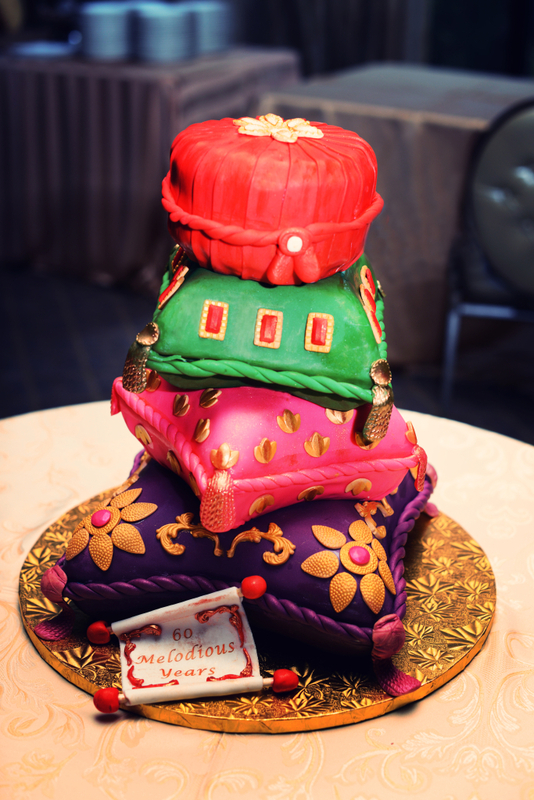 Neelma did an amazing job with the flavors and the design and we couldn’t love it more! For entertainment we had a live music band, Rakesh Raj and his group, sing along to the Antakshri songs. The set up was wonderful and everyone loved it. The three of us hosted the games and made sure everyone was involved and having a great time. 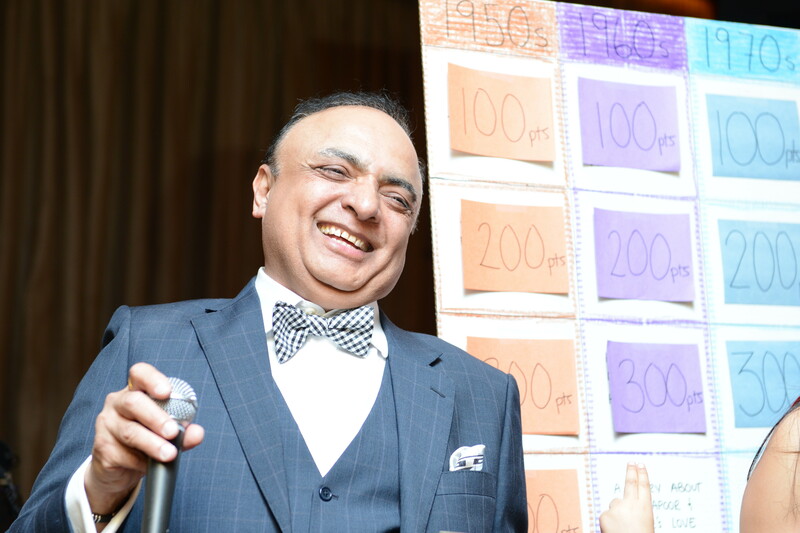 As you read in our post about the games, we made sure that the songs we chose were from an era that appealed to mom and her friends – and doing so resulted in them having a blast! 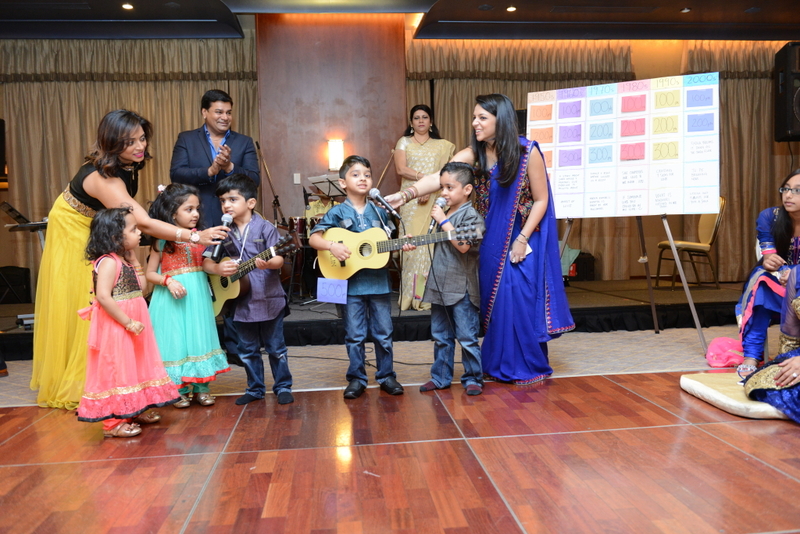 And of course no party is complete until all of Mom’s grandkids do a performance for her as well! 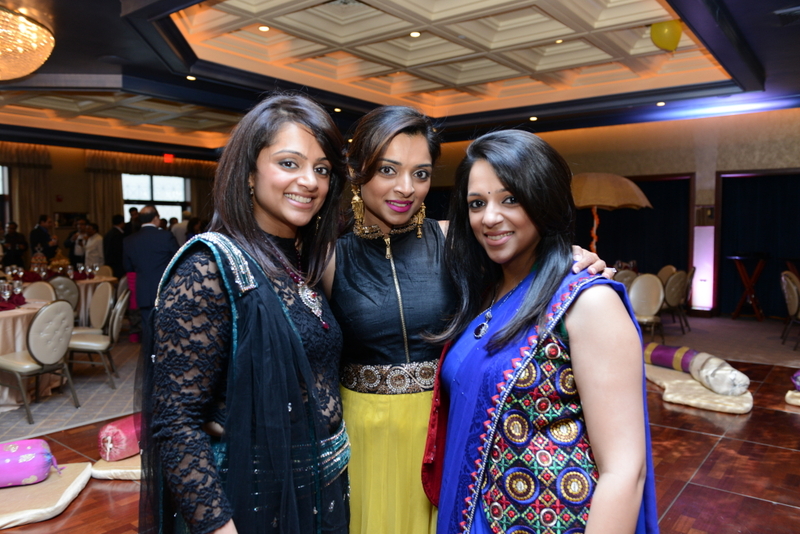 We also want to thank Julie for capturing the beautiful moments of the party! Of course she was pulled in a million directions to make sure every moment of this party was remembered and she did a great job! We had the pleasure of hosting a phenomenal 60th birthday party for both of our parents in styles that cater to both of them individually and together! 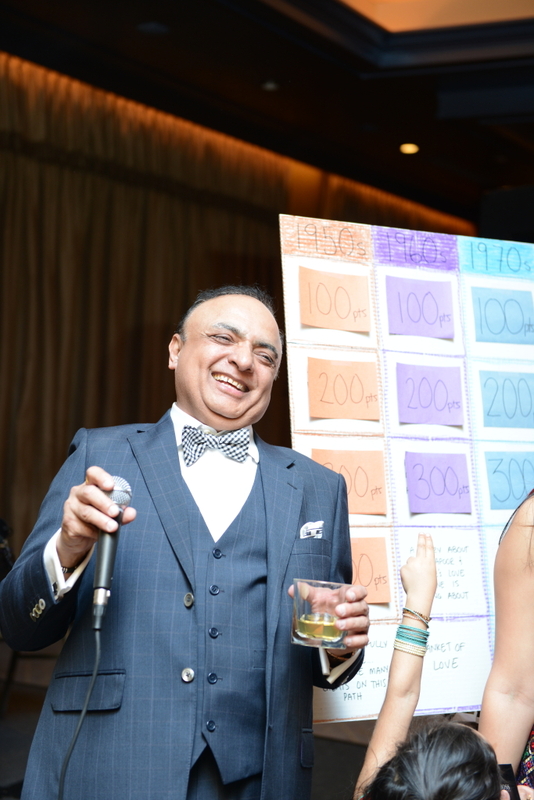 We did our dad’s 60th casino royale style, with gambling, cigars and his favorite whiskeys! We plan on take the amazing photos that were captured during both events and creating a special photo book for them to cherish forever! Oh and how can we forget the invitation! 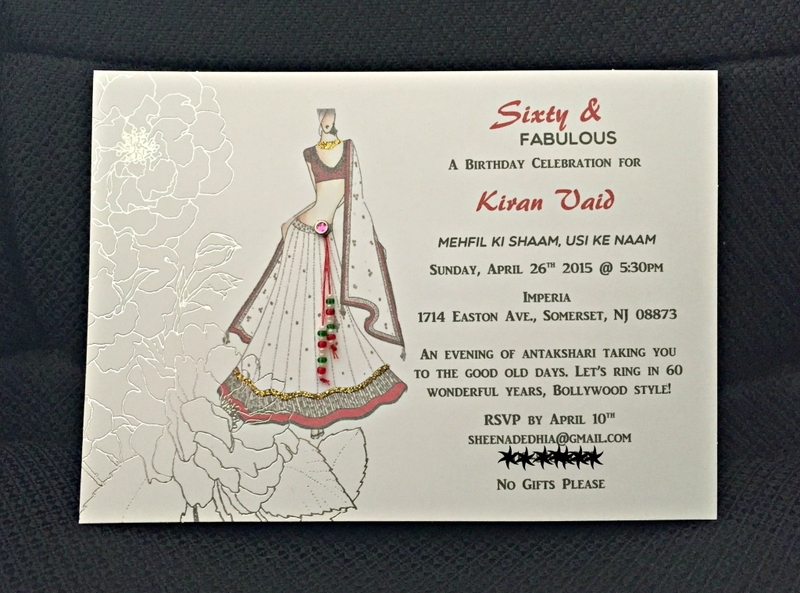 Mommy Vaid insisted Sheena create one of her DIY invitation cards for her fab 60th! And when mommy demands, we deliver! Sheena bought a ready cardstock and printed the lady and wording on it. She strung multi-colored beads onto a red string and tied a small knot at the bottom of each strand. She then took a bezel set stone brat and linked in strung beads onto it and inserted it through the card stock to create the dangling ties of the skirt. Mommy was happy = Her girls are happy! ShopRAR – The Ultimate Flash Sale!